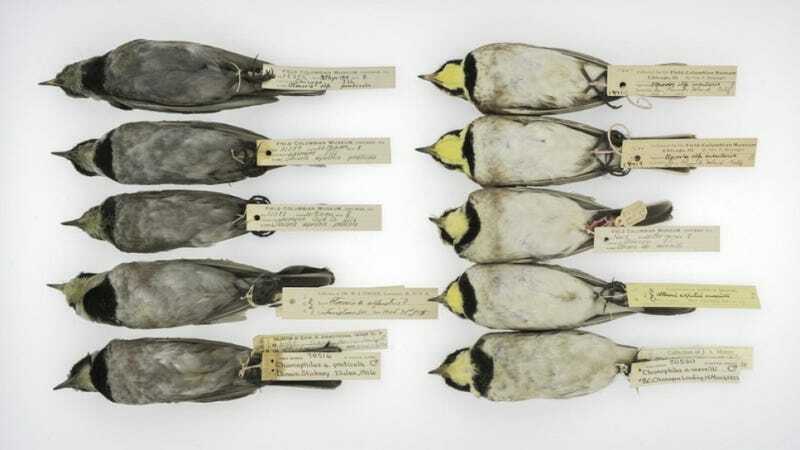 By analyzing sooty birds housed in museum collections, scientists have been able to track patterns of US air pollution over the last 135 years. As the new study shows, air at the turn of the 20th century was even dirtier than we thought—a finding that will now be used to improve our climate models. Horned larks, in addition to their dazzling yellow chins, feature a white underside that, unfortunately for them, is really good at absorbing tiny bits of black carbon; free-floating atmospheric soot clings to their feathers like dust to a feather duster. Today, most of these songbirds are able to maintain their bright, white appearance, but at the turn of the 20th century, horned larks were a miserable dark grey, particularly in areas where coal was king. New research published in Proceedings of the National Academy of Sciences shows that, by tracking the degree of sootiness in these birds over time, scientists can build a historical record of atmospheric soot. In this case, scientists from the Field Museum in Chicago and the University of Chicago compared the amount of soot on 1,347 birds kept in Rust Belt museum collections to track environmental pollution over the past 135 years (Rust Belt cities tracked in the study included Detroit, Chicago, Pittsburgh, etc.). Atmospheric black carbon is still a serious public health and environmental concern. Produced by burning coal, it’s a major contributor to human-instigated climate change. Scientists need accurate environmental data to track historical changes in air pollution over time, and crucially, to build increasingly accurate models for future climate scenarios. Unfortunately, however, modern environmental sampling didn’t start until the 1950s, so there’s a big gap in the scientific literature. This latest study is an effort to fill in some of this missing data. As this new study reveals, that missing data is embedded within the feathers of birds kept in natural history collections. Ornithologists at the Field Museum and elsewhere are well aware that specimens from the early 1900s are darker than expected, with atmospheric soot considered the likely culprit. For the study, co-author Carl Fuldner developed a photographic technique that allowed him to measure the amount of reflected light bouncing off the birds (fewer reflections means more soot has been absorbed by the feathers). Fuldner and DuBay analyzed five different species of birds with this technique, all of which lived and bred in the Manufacturing Belt of the United States. The researchers then plotted the amount of reflective light to the year in which the birds were collected (between 1880 and 2015), while also looking into the social history of urban air pollution. In addition, scientists documented an increase in bird sootiness during the Second World War, when wartime manufacturing drove up coal use, and a quick drop off after the war when people in the Rust Belt began to heat their homes with natural gas instead of coal. This study, in addition to revising our historical climate models, demonstrates the importance of maintaining museum collections. Data can often be found in the places where we least suspect. It also shows that a return to coal is probably not a good idea.